Tri-Guard Risk Solutions (TGRS) can help build security into your current software development efforts. TGRS has worked with major companies and government agencies build software assurance programs. No matter where your organization is in the Software Development LifeCycle (SwDLC), TGRS can help. We have expertise in integration security into AGILE development environments as well as continuous integration environment. Let our Subject Matter Experts ( SMEs) assist your organization’s Software programs with build in security. 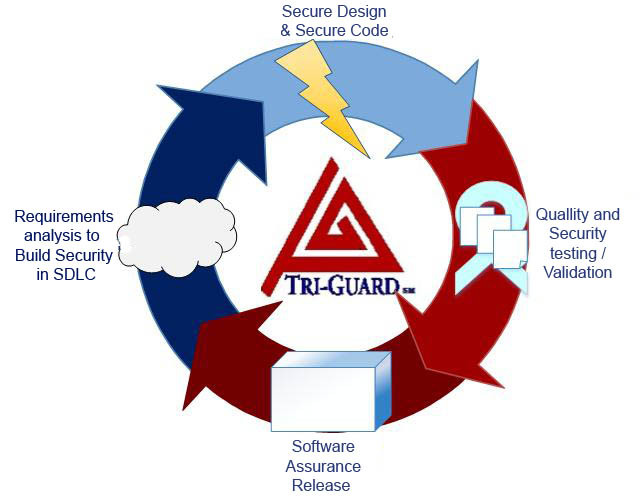 Tri-Guard Risk Solutions (TGRS) can assist with integration of security into your development environment. TGRS knows that software matures faster than the system and all too often security is not considered in the software environment. Let TGRS’ SMEs assist your organization with incorporating security into your development efforts. TGRS can customize a Software Assurance Program to enable better more secure software with risk based decision making in mind. Tri-Guard Risk Solutions (TGRS) can facilitate third party software assessment and testing for your development environment. Let TGRS’ SME audit your code prior to release. TGRS can also assist with your Certification and Accreditation needs as it relate to software and systems. Tri-Guard Risk Solutions (TGRS) has expertise to help build a better more secure mobile application. Our SMEs can assist with third party vetting of your organization’s mobile applications. Contact TGRS for assistance with vetting mobile applications and integrating them secure in your environment. Tri-Guard Risk Solutions (TGRS) specializes in software risk analysis. TGRS can help your organization go beyond current software risk identification, such as software schedule risk, resource risk and program risk, to identification of software quality and security risk. Let TGRS evaluate your organization’s risk needs and align a solution based on proven industry standards. TGRS knows compliance validation can only be accomplish thus understand the regulations, guidelines, directives, and standard. TGRS uses efficient systematic, risk based, quality system approach to validate security in your organizations environment. TGRS’ expertise can help align your organization’s need to security.